For Michigan’s 600,000 deer hunters, Nov. 15 is kind of like Thanksgiving and Christmas all rolled together. And when Roy Hinkson celebrated opening day in 2015, he expected to spend the day, as he had done dozens of times before, enjoying the outdoors, with his hunting partners, near his Upper Peninsula cabin. But, unknown to him, U.S. Forest Service employees were hiding nearby, waiting to spring a carefully laid trap. Once Hinkson was in his hunting blind, Forest Service and Michigan Department of Natural Resource officers swarmed the area and pulled the 69-year-old Vietnam veteran and his friends from their blinds. Although Hinkson’s cabin had stood since the 1950s, Forest Service officials had recently determined that the cabin and the hunting blinds were encroaching on federal lands. Their sting operation was the opening salvo in an effort to hold Hinkson accountable for constructing and maintaining a camp on National Forest System land. By applying collaborative management techniques to Michigan’s federal lands, we can reduce conflicts across the state and begin to enjoy improved environmental outcomes, such as improved forest health. Hinkson immediately removed his hunting blinds and tried to work out an amicable deal, offering to swap portions of his property with the Forest Service land on which his cabin partially sat, but federal officials refused. For the next three years, a growing list of increasingly weighty federal charges hung over his head. That changed only when U.S. District Court Judge Timothy Greely ruled that Hinkson had done nothing wrong and that the government’s actions would have produced an absurd result had he been found guilty. Hinkson’s story is just one of many that underlie the growing public concern that federal land managers, working within the confines of complex legislative and regulatory boundaries, are pushing public lands toward a state of inaccessible wilderness. Their actions effectively limit access to public lands by allowing only a narrow set of approved activities, such as nonmotorized recreation. For their part, federal managers respond that they are charged with managing multiple — often conflicting — priorities. Multilayered and complex legislation, paired with pressure from diametrically opposed and vocal interest groups, makes it nearly impossible for them to simply select one correct land use. Instead, they contend that they manage natural resources for the greatest good, for the greatest number, in the longest run. Complex and ever-changing relationships between private property rights, historical land use and environmental concerns are compounded by arcane legal and regulatory rules. Together, these factors ensure conflicts will arise. But not all these disputes need to end up like the Hinkson case: in court, or in drawn-out and expensive clashes. Collaborative management efforts that are being used in Michigan and around the nation today can offer valuable lessons for resolving the conflicts that arise over federal lands. The Mackinac Center recently worked with the Bozeman, Montana-based Property and Environment Research Center, otherwise known as PERC, to do research into collaborative methods of governing federal lands. 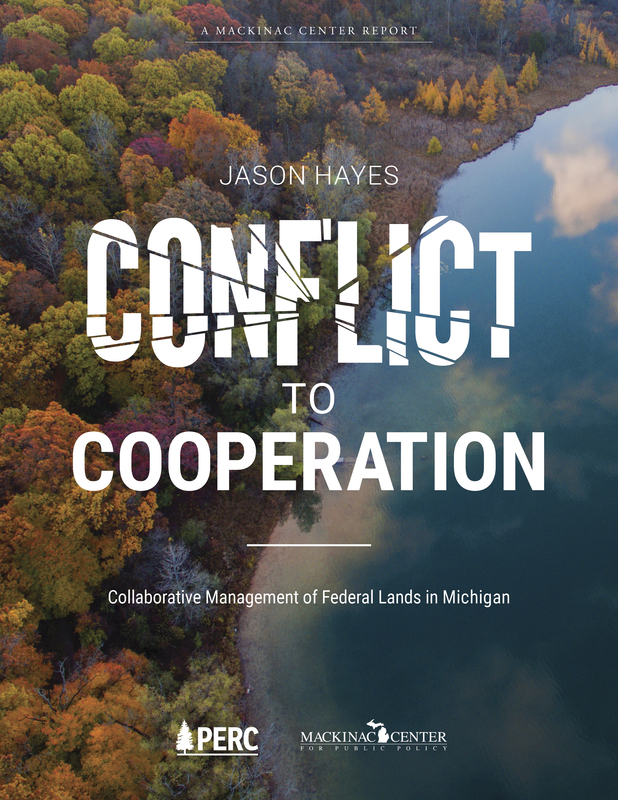 The resulting report, “Conflict To Cooperation: Collaborative Management of Federal Lands in Michigan,” reviews laws governing the use and management of publicly owned lands, and discusses conflicts between government land managers, private property owners and the public. The report then goes on to present examples of successful collaborative management approaches that have been used to resolve or avoid conflict in other situations. One such case is the Good Neighbor Authority, which encourages federal agencies that have limited staff or budgets to partner with better-equipped state governments. These partnerships allow state employees to work within federal guidelines to address a growing backlog of essential forest and watershed management activities, like spacing overgrown forest lands to help avoid fire, disease, or insect infestations. The report’s findings demonstrate that by applying collaborative management techniques to Michigan’s federal lands, we can reduce conflicts across the state and begin to enjoy improved environmental outcomes, such as improved forest health. As a further benefit, local communities can be involved in managing the natural resources in their area, and public access to Michigan’s national forests could increase.